You may ask yourself this question: how to write an expository essay? Writing an expository essay requires a breakdown of the story or events with the objective to clarify the story but without compromising on its integrity. The idea is to explain an essay in as detailed manner as possible. First, choose a topic for your expository essay yourself or ask your instructor to assign one for you. Ask your instructor to help you in understanding the guidelines. Once you know the topic and guidelines, you are expected to write an intention or objective of the expository essay. You will be expected to find literary sources that will advise or guide your framework. These sources could be found in books, journals, newspapers and websites. Note that all sources should be reliable and up to date. In this context, scholarly articles are most reliable. When carrying out research, you will be expected to note all references for purposes of citation. Before commencing on the write-up, you are expected to come up with a conclusive focal point that will generally guide a thesis statement. This is a stage where you need to get attention of your readers. The adopted thesis should be one statement that is specific and captures the essence of the main topic and main ideas. You can achieve this by using a famous quote, anecdote, rhetorical question or an opinion on a topic. Another option is by providing the background information that may guide the reader to an idea on the write-up. You would then embark on a thesis statement. This can be derived from the conclusion of your research (while using the sources). This should be a simple, precise and concise statement. You may want to edit the thesis as you write. This may be more pronounced when the ideas are still in the stage of changing and evolving. However, at the end of the expository essay writing, you will need to ascertain that the content, introduction and thesis are all aligned. The body paragraph of the expository essay should consist of the paragraphs that move from general to specific information. After reviewing literature and pre-writing stage of the essay, you will be in a position to determine how many paragraphs would be sufficient. Ideally, three paragraphs of evidentiary content, which supports the conclusion, would be enough. The main ideas should be presented in the paragraphs. Each paragraph ought to start with the main idea sentence and then followed by supporting evidence. Also note that there should be a logical transition from one paragraph to another. At this stage, you are also expected to relate each main idea statement with your thesis. This shall be done as part of a conclusion to every paragraph. Short statement of scope of the study, sampling of the study element, intention of the study, methodology or style of work. The data should take a general form. The conclusion should present a precise and concise opinion that is persuasive. In developing a conclusion, you are expected to initiate this paragraph by restating your thesis. The restatement should align with the supporting evidence. You are also expected to summarize the main ideas of the essay. In short, writing an expository essay can be an easy job if you break it into small parts and complete each part in a logical manner outlined above. 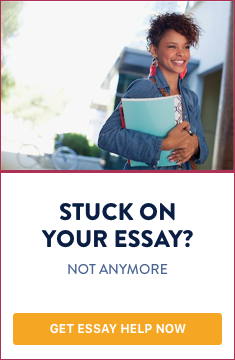 Do you need help with writing an expository essay?